Frequent readers of this Beethoven web site will have noted the various presentations of Beethoven work histories. In order to communicate even more lively with readers here, I will attempt a new approach at starting up such presentations, whenever this will be possible. Very recently, such a possibility opened itself up to me with the March 3 and 4, 2000, presentation of the special concert series EXTREME BEETHOVEN at Edmonton's Winspear Centre for Music with the Edmonton Symphony Orchestra under the baton of Mario Bernardi and with former Edmonton resident Angela Cheng at the piano, in the performance in two evenings of all five of Beethoven's piano concertos. What I will attempt here is an as lively and as honest description of the impact of these performances on me, as possible. However, in doing so I will, as a lay person, draw on resources for comparison and illustration that I, as a native German speaker and writer of this web site, am actively and passively involved in with respect to their exploration for my own better understanding of the cultural issues of classical music in general and of Beethoven in particular. If I may, therefore, take you along on a brief re-visit of this event, you will, perhaps, better understand my motivation for subsequently rendering the history of the creation of all of Beethoven's piano concertos together in one presentation, yet in chronological manner, as usual. I wish you as much enjoyment in reading this re-visit as I had in writing it for you! Piano Concertos No. 1 and 5. While it might go too far to have you follow me in describing every nuance of this challenging performance, I will try to attempt a compromise at describing my general and certain particular impressions. First of all, Miss Cheng's rendition of all of these concertos in two evenings, without the use of sheet music, presents to me a level of dedication as well as of proficiency that speaks for itself. Before I will set out the parameters of what I was paying particular attention to in these performances, let me begin by briefly describing the beginning of the first movement of Piano concerto no. 2 on March 3rd. : It evoked in my mind the following comparison: in his 1870 Beethoven essay, Richard Wagner speaks of the dreamer whose state of awakening out of his lighter dream phase and his first, intuitive utterance, can be compared to the emergence of music into the world of hearing, out of its own hidden realm. Setting the musicological and scientific validity of this statement aside, it still occurred to me to provide some similarities to the beginning of the first movement's tutti under Bernardi's baton (whose conducting style made on me the impression of "controlled serenity" as compared to Maestro Grzegorsz Nowak's style of "dynamic sensitivity") and to Miss Cheng's being entirely entranced in following every note in her mind and her own hands' descending onto the piano. With respect to what I was trying to pay particular attention to, I can relate that, had I not been able to attend this event, I would have asked one of the fortunate ones who did, as to how she was able to not only play these works as flawlessly as she did, but also as to how she would have managed to bring across Beethoven's strength in his forte movements and, in contrast to this, the differing impact of intensity of his adagio/respectively slow movements. 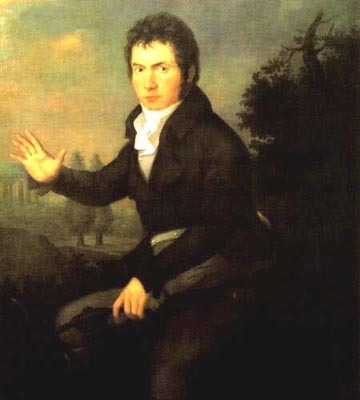 Particularly in his adagios/respectively slow movements, Beethoven was able to express quite different emotional states and the character of these expressions might also have changed with his progress as an artist. Since the creation of these piano concertos stretches from the early 1790's with concerto no. 2 to 1810 with concerto no. 5, and since we have gained from the Biographical Pages of this web site a general impression of his personal and artistic development, we can recognize that the adagios/respectively slow movements of these five concertos provided, first to Beethoven and subsequently to all of his musical interpreters as well as to all listeners exposure to a great variety of intensity of expression. With respect to how Miss Cheng was able to apply herself to both the challenge of expressing his musical strength in the forte movements as well as the diversity of expressions in his adagio/respecitively slow movements, I can only state that I even saw her "Beethovenish" determination in her face and that it matched what I heard, while her ability to match the range of expression in his adagios/respectively slow movements always arose out of her sensitivity to the preceding orchestral parts with her "following suit" as much as if, for example, two seasoned actors would be able to "share" the expression of one profound statement (I leave it up to you to make your choice of favorite literature and your recollection of any memorable theater performance) by one actor's beginning it and the second actor's finishing it. While I had always entertained an "instinctive" caution in the face of Wagnerian music which is based on personal musical experiences that may be neither here nor there, and while I am still and perhaps always will remain "cautiously critical" of Wagner's writings on the subject of music and of Beethoven in particular, I must, a the same time, also admit that this consummate musician and undeniable genius in his own right cannot but have made certain statements that do lend themselves to comparison, yet with a mark of caution in one's mind at all times. In his Beethoven essay, he also pointed out that, if we as listeners are truly moved by great music, we will become less and less aware of our surroundings while doing so, while, contrary to this, the mere observation of an orchestra's activities might border on banality and ridicule. This observation can, in my humble opinion, not be summarily contradicted, since it depends very much on the individual listener's frame of mind and on his ability to become thus thoroughly involved in a listening experience. As a listener who also had to, in order to render any useful report, pay attention to such "banalities" as Wagner would express it, I could also make several observations. One of these was that Maestro Bernardi displayed a sense of human and musical tact that I, at least, appreciated very much. At the end of the first movement of piano concerto no. 2, he turned around and looked at Miss Cheng as well as at the audience before setting in with the second, slow movement, and obviously for the purpose of seeing as to whether the audience would be inclined to applaud right then and there or whether it would reserve its applause for after the completion of the third and final movement of this work. A compliment should go to the level of sensitivity of the Edmonton audience for not showering the performers with applause at this time! It should also be noted that they remained consistent and rendered their enthusiastic applause each time at the completion of one concerto. While the first evening posed a complete 'musical surprise' to all listeners, we were already 'getting used' to the proficiency of the performers during the second evening, which does not mean that the impact lessened to any degree. While I can imagine that the audience enjoyed these performances as much as I did, I can also imagine that many listeners might have also enjoyed a 'tour de force' of music history through two decades of Beethoven's development and might have felt compelled to re-visit these works many times after in their own favorite recordings. To me, this event provided an excellent starting point for my own journey through this part of music history which I want to share with you in this presentation.